A fun way to get out and see Rovinj from the water and to enjoy the numerous islands and bays around Rovinj is to take the boat excursion leaving from the city pier. 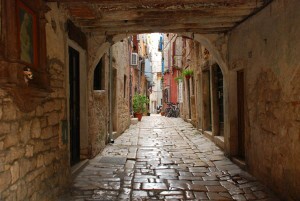 A few days and nights in Rovinj, Istria will teach you to pack a belt with a few extra holes. 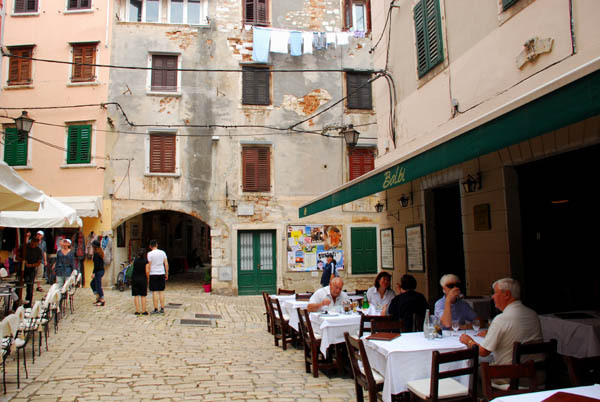 We certainly gave the chef at our favorite hole in the wall restaurant a workout, eating there twice for dinner and again for lunch when we fled the less than charming inner town of Pula and drove back to Rovinj where we knew we could count on an excellent meal. Food is an important part of a European Focus experience, and we take a lot of pride in finding just the right place. 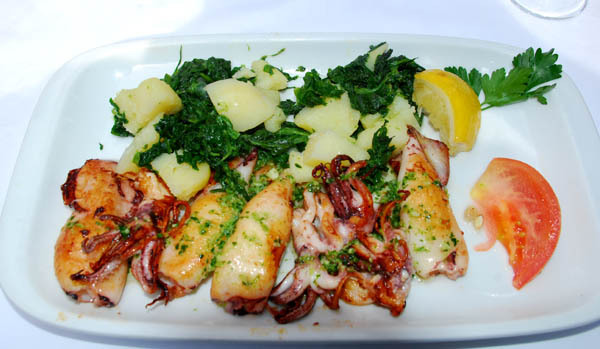 At Balbi, tucked away on a little square in the medieval core of Rovinj we found excellent seafood, pastas and meat dishes and best of all, warm and authentically friendly service that kept us coming back. Calamari for lunch. With a local beer or a glass of the local white wine, perfect. 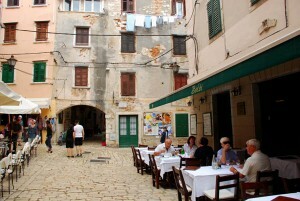 Our favorite restaurant, “Balbi,” in a quiet square tucked away in the medieval quarter. 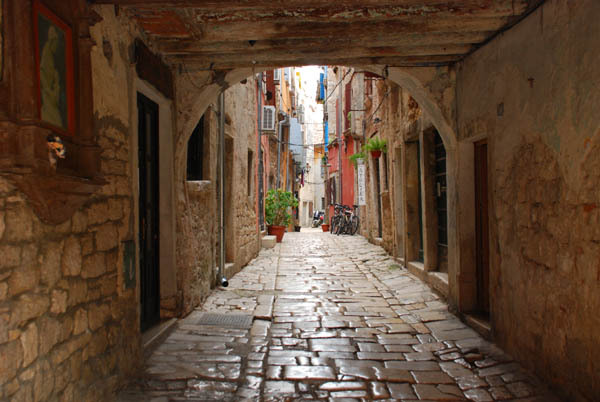 Rovinj is full of corners, squares and narrow lanes that one wants to explore. Rovinj was already a settlement of Illyrian tribes before being captured by the Romans, who called it Arupinium or Mons Rubineus, and later Ruginium and Ruvinium. Built on an island close to the coast, it was connected with the mainland in 1763 by filling in the channel. It became part of the Byzantine empire, then in the sixth century part of the Exarchate of Ravenna and in 788 part of the Frankish empire. Then it came under the rule of different feudal lords for several centuries. From 1209 it was ruled by the Aquileian patriarch. 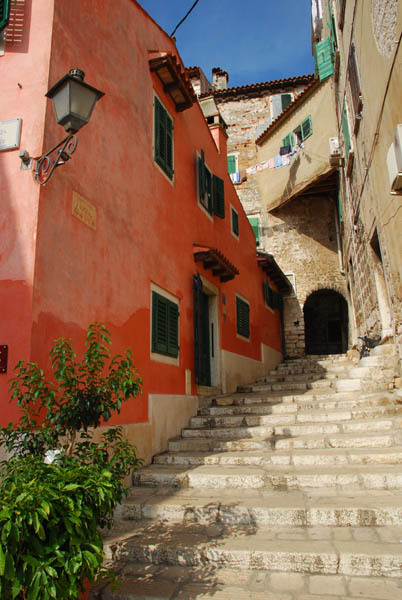 From 1283 to 1797 Rovinj was one of the most important towns of Istria under the Republic of Venice. The city was fortified by two rows of walls with three town gates. The remaining town walls date from this period. 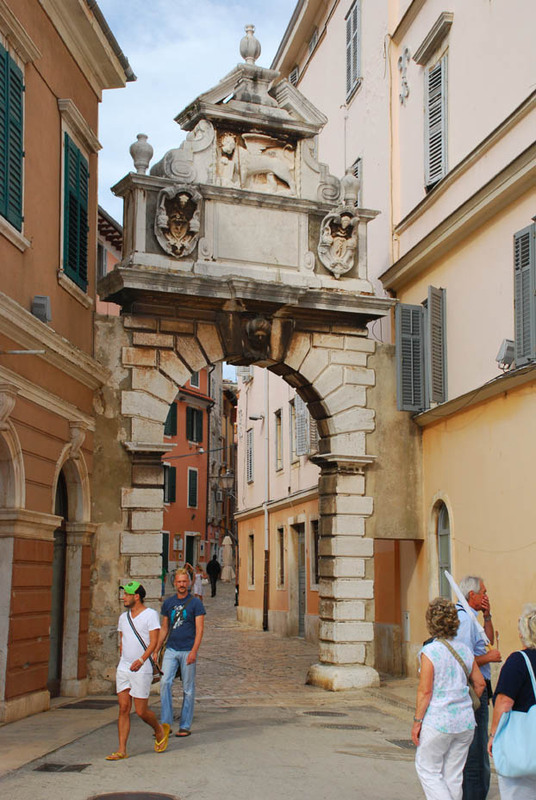 Close to the pier one can find the old town gate Balbi’s Arch, dating from 1680, and a late-Renaissance clock tower. The city got its statutes in 1531. 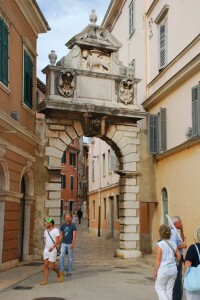 After the fall of Venice and the Napoleonic interlude, Rovinj was part of the Austrian Empire until World War I. According to the last Austrian census in 1911, 97.8% of the population was Italian-speaking. Then it belonged to Italy from 1918 to 1947, when it was ceded to SR Croatia within SFR Yugoslavia. During that period many of the Italian inhabitants left the city. A tall ship in the harbor, and the crystal-clear waters around Rovinj. The best times to visit Rovinj are during the shoulder periods of early May and late September. Summer crowds from the cruise ships can be very intense, and the heat can make al fresco dining uncomfortable or even impossible. 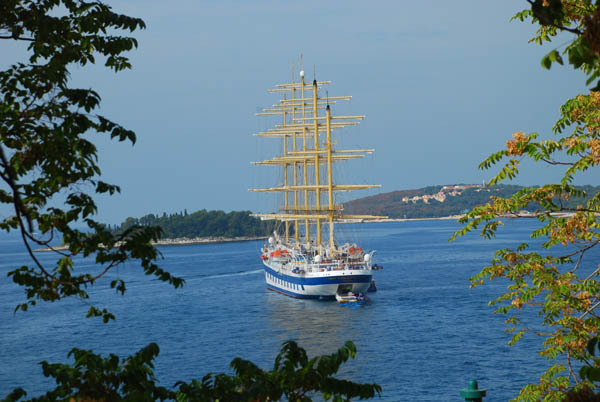 Posted in Croatia Tours and tagged croatia, custom, customized, europe, group, in, istria, luxury, private, rovinj, small, touring, tours.